Many of us know the benefits of eating butter from grass-fed cows, but what about the myriad health and cultural advantages of eating pork lard? Researchers are now admitting, lard from organic pastured pigs may be more nutrient-dense than its dairy counterpart. Higher in monounsaturated fats (good), naturally high in vitamin D and a "vitamin A-like factor" and devoid of trans-fats, pork lard is making its way back into the kitchen. The Weston Price foundation has long been a proponent of healthy fats. Pork lard, beef tallow, duck and goose fat... all apparently good for us, if sourced from healthy organic animals. But health benefits are just one reason to love healthy pork fat. Many of the world's cultures have long celebrated lard. Italians cure it with rosemary and spices --- Lardo di Colonnata, cured for months in marble basins. It's listed in the international Ark of Taste. The process is to start with pure pork fat, massage it with sea salt, black pepper, rosemary and fresh garlic. Additional spices can be added. The process is centuries old, and is a delicacy they say. 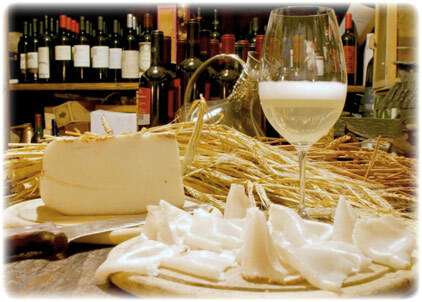 Lardo di Colonnata is a high-end lard experience. Image courtesy Wikimedia commons. But it's not just the Italians who relish hog fat. The Ukrainians have their own lard recipe, called Salo. 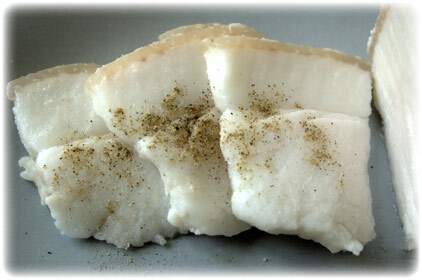 Not exactly similar to Lardo, the Slavic version differs in terms of spice content, but both are unrendered. The Ukrainians see it as an important part of their national culture. The even have a festival. Ukrainians love Salo, one of their national foods. Image courtesy Wikimedia commons. For our family, we're realizing that healthy lard is a vital part of our nutrition. And while we primarily use lard in our breakfasts (and anything we fry), we're discovering a vast panorama of lard recipes which go beyond our North American culture, extending back hundreds of years. It seems our ancestors understood that fat from healthy animal sources is a gift to be treasured. If you haven't tried some of our organic pasture-raised lard yet, now is the time.